Yes, it has been too long. Time seems to be get away from us. Genealogy filing stacks up which is what led to this post. I’ve had some family photos that needed scanning such as the the photo below. 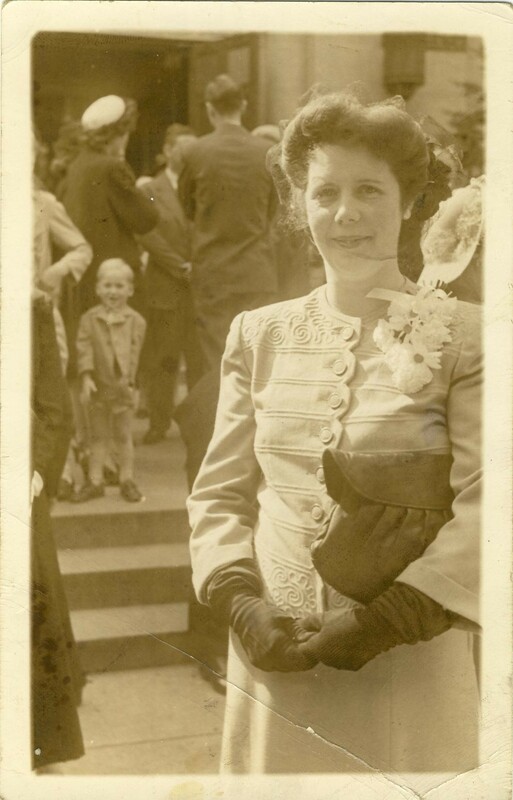 The back of the photograph has the caption “Mother – Harry – Odette – Honore”. Mother is Elizabeth Speers (nee Green) Mackenzie. “Lizzie” (b. 7 Feb 1867; d. 29 Jan 1958) was born in Dundee, Angus, Scotland and passed away in Kenora, Ontario, Canada. Harry is Harry Stuart Mackenzie (b. 25 Jun 1893; d. 24 Aug 1918). Harry was a member if the Canadian Infantry (Manitoba Regiment) and passed away fighting in World War I in France. He is buried in Hillside Cemetery , Le Quesnel, Somme, Picardie, France. The young lady in the top is Odette Henrietta Mackenzie (b. 16 Nov 1894; d. aft. 1940). Odette married a prominent doctor, Dr. Albert E. Ady. Odette is presumed to have passed away in Iowa. The young lady in the first row is my grandmother, Honore Millicent Mackenzie (b. 7 Nov 1898; d. 27 Sep 1991). Honore married Howard Robinson Wheeler in Winnipeg and had their first child (William Stamford Wheeler). Howard and Honore eventually immigrated to the Unites States in International Falls, Minnesota. 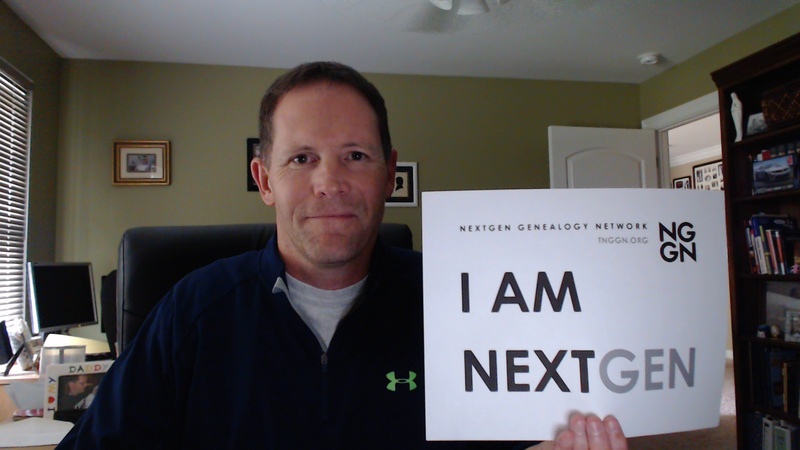 While doing research for our local genealogical society (http://www.mcigs.org), I came across a post from Jen Baldwin of FindMyPast which led me to the web site of The Next Generation Genealogy Network (NGGN). In a nutshell, NGGN is committed to bridging the divide between different generations of genealogists. Having attended several genealogy conferences, I can attest that younger generations (millennials) are not as well represented as GenX and Baby Boomers. In addition, NGGN is helping societies understand that the way that we have historically managed our genealogical societies will not attract the younger generations. For example, with less disposable income they don’t understand why they should pay to be a member. The younger generation also expects the use and availability to use social media. For example, this may mean that societies use YouTube and streaming content for monthly meetings. I was so impressed with NGGN that I volunteered to help. Due to my calendar, right now I will be serving as a Community Liaison. 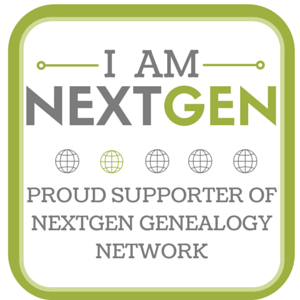 I will be attending genealogy meetings and conferences and proudly waving the NGGN flag. My great grandfather on my fathers side (William S. Wheeler, Honore M. Mackenzie, William A. Mackenzie) immigrated to Canada from Scotland. William Alexander Mackenzie was born 15 Oct 1858 in Cupar, Fife, Scotland. William Mackenzie is the son of William Mackenzie (b. 11 Sep 1828, d. 11 Apr 1893) and Elizabeth Boyd (b. Abt 1833, 29 Sep 1915). William, his seven siblings and his parents were found in the 1861 census in Cupar, Fife, Scotland where his father was listed as a gas engineer. In 1871 William and his family, while still in the county of Fife, had moved from Cupar to Dunfermline Burgh at 17 Rolland Street. In 1881, William is found with his family at the same address where his occupation was listed as a ‘linen salesman’. William emigrated to Canada in 1885. William arrived in Canada in 1885 and settled in Brandon, Manitoba, Canada. Four short years after settling in Brandon, William married Elizabeth Speers Green (b. 07 Feb 1867, d. 26 Apr 1938) in Brandon on 17 Sep 1889. William Alexander Junior was born four months after their marriage. In 1897, William and his family moved from Brandon to Kenora, Ontario, Canada. William owned and operated a department store in Kenora and also became the president of the board of trade. William and his wife “Lizzie” had five children (William, Storemont, Harry, Odette and Honore). William passed away 26 April 1938 and is buried at the Lake of the Woods cemetery located in Kenora. One of my first brick walls was that of my 2nd great-grandfather, Willard Wheeler. Willard Wheeler was born 18 August 1820 in Westmoreland, Cheshire, New Hampshire. Willard had a twin brother, William. Willard and William were the sons of Barnard Wheeler (b. 06 Dec 1788; d. abt. Jul 1836) and Susanna Pierce (b. 25 Mar 1787; d. unknown). Willard lived with his parents on 12 siblings in Swanzey, New Hampshire. About January 1849, Willard married Emily Maria Stanford (b. 11 Aug 1829; d. aft 11 Jan 1883). Shortly after their marriage, Emily and Willard relocated to nearby Winchester, New Hampshire. Emily and Willard had six children, all of them born in Winchester, New Hampshire. Willard was a farmer and passed away shortly after the birth of their sixth child due to an accident from an explosion. Willard is buried at South Winchester cemetery in an unmarked grave. Recently I have a renewed appreciation for quality of data as it pertains to genealogy and family history. Over the winter I spent the cold summer months cleaning up my the place names in the my FTM database. I would like to do the same with my sources but I am having trouble finding documentation and education on doing so properly. I have found a number of blogs and brief articles on the topic, but nothing comprehensive. If anyone is aware of any sites, books or resources on the topic, please leave them in the comments. Elizabeth “Billie” Helen Beasecker was born 27 December 1907 in Melrose Park, Cook County, Illinois. Elizabeth Beasecker is the daughter of Katherine Kinney (b. 11 Oct 1869; d. 23 Dec 1912) and Sylvester B. Beasecker (b. 06 Feb 1859; d. 01 May 1933). Elizabeth was the fourth of four children born of Katherine and Sylvester. Elizabeth was only five years old when her mother passed away (during a gall bladder operation). 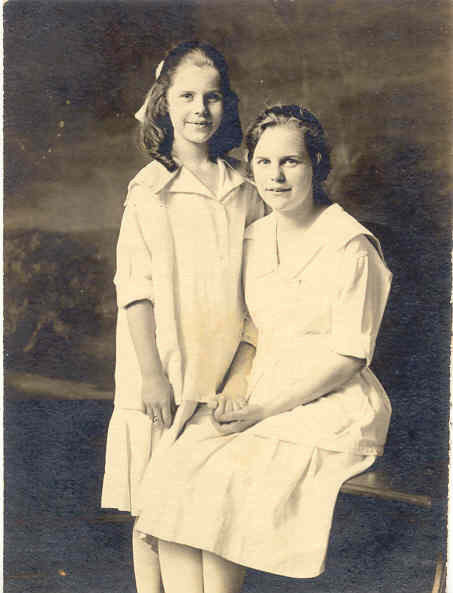 Since her father planned on relocating to find work, Elizabeth moved in with her Aunt Nellie (nee Kinney) Mader along with her sister Mae. This is where Elizabeth established a very close relationship with Clara Mader (b. 09 Nov 1903; d. 06 Dec 1974). (Elizabeth Beasecker [right] and Clara Mader [left] about 1922). Elizabeth’s father (Sylvester) eventually found work in Duluth, Minnesota and he also found his fourth wife Mary S. Graham. Elizabeth and her sister Mae live with their father and their step mother for a short time before returning to Chicago to live with their aunt Nellie. About 1930, Elizabeth met John Patrick McGinty. John and Elizabeth were married 27 June 1932 at Presentation B.V.M. Church in Chicago. In attendance and standing up at their wedding were John McGinty’s brother Thomas as well as Clara Mader. Not only was Clara the maid of honor, Clara would later be the godmother to Elizabeth’s third child, Mary Margaret McGinty. Shortly after her husband’s passing in 1962, Elizabeth relocated to Florida to be with her sister Mae in more pleasant weather. Elizabeth passed away 31 December 1992 in Minneapolis, Minnesota. Elizabeth was relocated to All Saints cemetery in Des Plaines, Illinois to be laid to rest next to her husband. I’m not sure where I saw it but I came across a question something along the lines of “if you could have 5 minutes with any ancestor who would it be, any why?” I saw this question over a week ago and it has been sitting in the back of my mind ever since. I honestly couldn’t decide. Many ancestors I wanted to talk to in order to ask questions about their ancestors (yes, these are my brick walls). In another case one person that I wanted to spend 5 minutes with was my maternal grandfather because he passed away before I was born.